Inordinate delays in executing joint aircraft production projects have meant that India and Russia have squandered their chances to become world leaders in this field. Cooperation between Russia and India has made great progress in the area of aircraft construction. However, problems these countries face in this area prevent them from developing on these successes. In 1996, Russia and India concluded a $3.5 billion contract for the design and manufacture of the two-seat twin-engine Su-30MKI fighter. By this contract, India was supplied 18 Su-30K fighters between 1997and 1999, and 32 Su-30MKI fighters between 2002 and 2004. 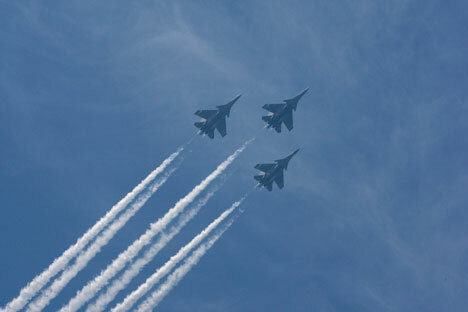 In 2007-2008 India received 18 Su-30MKI fighters for $700 million. Beginning in 2008,supply of 40 Su-30MKIs to India began, for the sum of $1.6 billion. In 2000, an agreement for the licensed production of Su-30MKIs in Nasik, India was signed.. Components for assembly are delivered there from Irkutsk, Russia. A total of 140 fighters were to have been assembled. During the course of the project, the parties decided against full localization of production, limiting it to the assembly of parts supplied from Russia. According to information from 2015, there are 350 Su-30MKI fighters in the Indian Air Force. Contrasted with this successful project, joint development of the fifth military transport plane and the fifth generation fighter has yet to make progress. Russia and India signed an Agreement between the two governments for Joint Implementation of a Programme for the Creation of a Multipurpose Transport Aircraft on 12 November 2007. In January 2005, Defence Ministers of both countries gave instructions that an inter-governmental agreement be readied within a period of two months. After the document was signed, the project continued to proceed at a similar slow pace. The direct contract for the design of the aircraft was signed in May 2012 instead of the projected 2008. In November 2012, an office was opened for the joint enterprise MTA Ltd (MTAL) in Bangalore (state of Karnataka); its founders were the United Aircraft Corporation (UAC) (25%), Rosoboronexport (25%) and Hindustan Aeronautics Limited (HAL) (50%). Instead of launching the first flight tests in 2013 as expected, MTA had only developed a preliminary design by autumn that year. According to that design, the length of the aircraft was to have been 33 m; wingspan - 30 m; maximum takeoff weight - 55-60 tons; load carrying capacity - 18.5 tons; flight range - 2,000 km; and cruising speed - 800 km. However, this draft design has still to be approved. This made Y. Slusar, president of the UAC call on the Indian side to “maximally speed up all procedures for the approval and acceptance of the results of the preliminary stage (design)” in June 2015. The agreement between the Russian and Indian governments on Joint Development of a Prospective Multifunction Fighter was signed on 18 October 2007. A year earlier, the Indian side had sent the requirements and characteristics of the future aircraft to the Russian side, but these requirements were generallyignored, since Russia decided to focus on the “joint modification” of the Russian PAK FA (T-50) plane instead of on joint development of the prospective fighter. In December 2008 a general contract was signed for the development of the fighter, and in December 2010 the contract for the development of the preliminary draft was signed, for $295 million. This project was completed by June 2013, instead of the planned 2012, after which both sides were to have approved it and transitioned to the building, testing, and production stages for the fighter. This did not happen due to unresolved issues. In early 2014 it became known that the Indian Air Force’s major complaints were about the Russians’ reluctance to allow them full access to technology (even though from a financial standpoint this project was evenly split), the fact that the fighter did not conform to New Delhi’s requirements (particularly in relation to the engine and radar), and its price. Taking into account delays in the implementation of projects for the multipurpose transport aircraft and the prospective multifunction fighter, these machines, if brought into serial production, could end up being hopelessly outdated. To let this happen would mean Russia and India have squandered the experience they acquired together in the area of aircraft construction, and their losing the possibility to jointly claim a place as world leaders in this field.